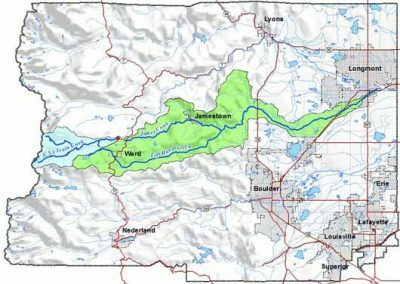 Located just 3 miles north of Boulder, Colorado, in the Front Range of the Rocky Mountains, the 76-square-mile Left Hand Creek Watershed is a hidden gem with unique historical, recreational, and ecological resources. 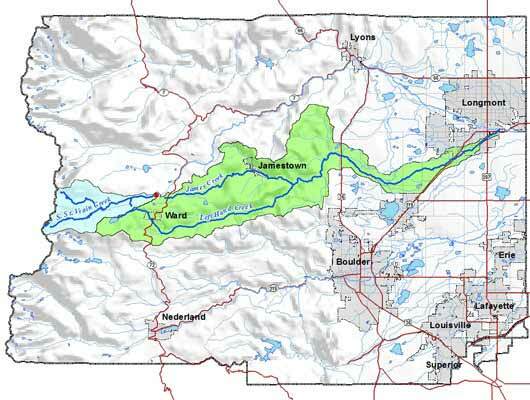 Left Hand Creek is an important water source for the community, as it serves as the primary source of drinking water for 20,000 customers of the Left Hand Water District, as well as a source of irrigation water for farmers and ranchers. The creeks in the watershed also provide aquatic habitat for numerous fish species and other aquatic life, including two state-listed fish species of special interest. Along the palisades reach near Buckingham Park, golden eagles frequently soar. The plains reaches are known for their stately cottonwood trees and important agricultural lands. As one of the most renowned locations for road cyclists in the Rocky Mountain Front Range, and as local trout hotspot for anglers, Left Hand Creek Watershed provides important recreational opportunities for the community. Occasionally kayakers pit their skills against the rushing spring runoff. Public access points at popular parks provide opportunities for hiking, mountain biking, picnicking and exploring the creek. Land ownership in the watershed varies from federally owned national forest to city and county open space, to privately owned riverside lots, farms, and ranches.